Location: Bosworth St. and Diamond Heights Blvd. In a city known for its hilltop parks that drive home their urban surroundings with spectacular views, Glen Canyon Park is one of those rare places where you can leave the city behind and lose yourself in wooded canyon trails. With a creek flowing down its length, rock outcroppings framing its sides, and a wide variety of native vegetation throughout, this is an excellent place to bring your dog back to nature without leaving the city. Entering the park from its main entrance off of Diamond Heights Boulevard you’ll pass several athletic fields and the Glen Park Recreation Center on the way to the first open area where dogs are known to congregate. Following the main trails on either side of the creek, you walk up the canyon and past a series of impressive rock lookouts that offer nice views of the canyon scenery. As you climb in elevation the trail narrows, becoming almost hobbit-like in places, before looping back down the hill. While there are several side trails to explore, this is mainly and out-and-back affair that takes about half an hour to complete if your dog doesn’t get distracted by the gophers in the grass. 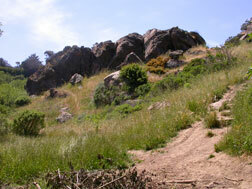 Glen Canyon Park is the anchor and namesake of the Glen Park neighborhood that’s located south and west of the Mission District and Bernal Heights. Follow Bosworth Street up the hill from Glen Park neighborhood and take a right on Diamond Heights Boulevard to get to the main entrance. While there’s no parking lot for the park, street parking on and around Diamond Heights Boulevard is usually easy to find. There are many smaller entrances from Bosworth and other streets that line the park. While dogs are welcome in Glen Canyon Park they are required to be on leash. Many dog owners ignore this rule, especially further up in the park beyond the multi-use athletic fields. There are several posts with plastic bags for cleaning up, but they are frequently empty and it’s a good idea to bring your own. As always, keep control of your dog at all times and obey good dog park etiquette. See our “Dog Park Tips” page for more advice.